FINE ESTATE & VINTAGE JEWELRY. 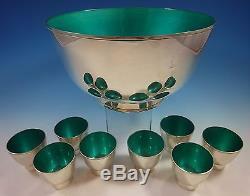 Towle Sterling Silver Punch Bowl and Cups with Turquoise Enamel (#1392). 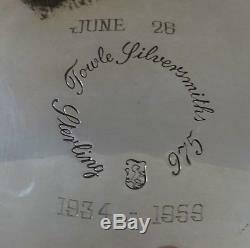 Towle Impressive Towle sterling silver punch bowl and cups. 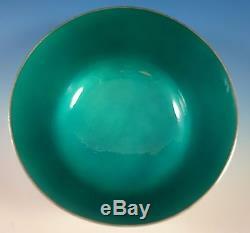 &###xA0;The bowl and cups have a beautiful turquoise interior enamel. They were given as a 25th anniversary gift on June 26th, 1959. &###xA0;There are eight cups including six cups with no monograms, one cup with a "W" monogram, and one cup with an "A" monogram (see photos). 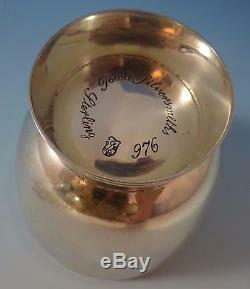 &###xA0;The cups are marked with #976. 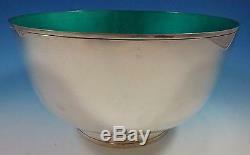 &###xA0;The punch bowl measures 6 1/2" tall x 12" diameter, and it weighs 65.31 ozt. 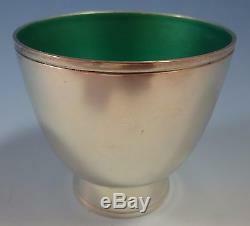 &###xA0;The cups measure 2 1/2" x 2 1/2", and they each weigh 3.2 ozt. &###xA0;This set is in excellent condition. Customer service is the foundation of all that we do. We pride ourselves on our customer service. How do I return my product? This listing is currently undergoing maintenance, we apologise for any inconvenience caused. 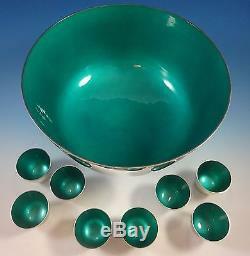 The item "Towle Sterling Silver Punch Bowl and Cups with Turquoise Enamel (#1392)" is in sale since Friday, January 13, 2017. This item is in the category "Antiques\Silver\Sterling Silver (. The seller is "antiquecupboard" and is located in Waukesha, Wisconsin. This item can be shipped worldwide.